Hello Minions! Molotov is Back, with a New Podcast Project. Click the logo below, or just read on! We’re doing business in Baltimore, MD as The National Edgar Allan Poe Theatre. 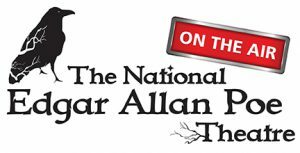 Starting very soon, your favorite podcast outlet will air the first in a series of new podcasts by The National Edgar Allan Poe Theatre On the Air, with its production of The Tell-Tale Heart. The series features fresh, 20- to 30-minute podcast adaptations of the best-known works of Edgar Allan Poe, America’s renowned master of horror and suspense. Each episode guides listeners through a mental hospital where each cell houses Poe protagonists, each waiting to thrill audiences with dramatic re-tellings of familiar stories including The Tell-Tale Heart, The Black Cat, Berenice and The Cask of Amantillado. Musical underscore and sound effects add even more suspense to the stirring character accounts, brought to life by a creative team of performing artists and talent from the Baltimore metro area. Molotov has teamed up with GoodSearch and GoodShop. Name Molotov Theatre Group as your charity and we get a donation whenever you search the web or shop at over 5,000 retailers across the country. For specific instructions on how to make the best use of all the options this service offers, click here. Or click the GoodShop icon below. ALSO, Amazon will donate a small portion of each purchase you make on AmazonSmile to Molotov Theatre Group. Click here to get started: http://smile.amazon.com/ch/26-1552922, or click the link below. What could be easier? Go team — and thank you! © 2019 Molotov Theatre Group. All Rights Reserved.